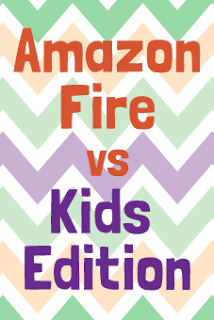 Amazon Fire Kids Edition vs Basic Fire: Which Tablet Should You Choose? 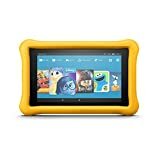 Amazon have announced a new version of the Amazon Fire Kids Edition (price at time of writing $99 with 16GB) and a new entry level Fire tablet (price at time of writing $49 with 8GB.) They are both interesting options for kids, tweens and teens, but how do they compare? Update: New Amazon Fire tablets announced for 2017 including a new 8" model in the US. This article has been updated for these new devices. Let's take a look at how the two tablets compare for child and family use. It's not all about the hardware as we'll see. The table 7" tablets and bundles are available in the US and UK, the 8" bundle has only been released in the US so far. The cheapest basic Fire model is the 7" 8GB with special offers (ads). The Kids Edition is based on the 16GB version of this table without the ads. There's also an 8" 16GB Fire with special offers and an 8" Kids Edition model with 32GB of storage and no ads. The Kids Edition bundles are available with a choice Pink, Blue and Yellow cases. So, how do the hardware specifications of the two devices compare? 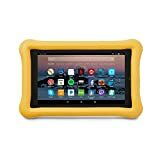 Well, if you look at the detailed description of the Fire Kids Edition you will see that it actually includes the basic Fire Tablet (but with additional storage and no ads.) So, as far as we can tell, the hardware is exactly the same. Important note: By default Amazon will offer you the 8GB version of the basic Fire but the 16GB version of the Kids Edition. If you don't look carefully you might compare the Kids Edition with the entry level Fire for $49.99. This version only comes with 8GB of storage though. The Kids Edition offers 16GB of storage. The 7" 16GB Fire retails for $69.99. So actually the 7" Kids Edition is only $30 extra. The warranty for the Kids Edition is described as a '2 Year Worry Free Guarantee' and Amazon says "If they break it, we'll replace it. No questions asked." Mechanical and electrical faults are also covered. So you can get accident cover for the Fire, but this does exclude intentional damage. So it looks like the coverage offered by the Kids Edition is broader. It's hard to do a direct comparison here, but the warranty should be worth at least $14.99. For older kids, the case is going to be a negative. Tweens and teens will want a cool case not a kiddy bumper case. Update: The basic Kindle Fire 7" is now available in a range of cool colours which will appeal to tweens and teens. The Kids Edition includes one year of Amazon FreeTime Unlimited which gives access to loads of kid friendly content: books, movies and TV shows, education apps and games. The Amazon Fire tablets are all about the content. FreeTime Unlimited makes a lot of sense for children in its target age range of 3 to 10 years old. We'll do the maths for you: $1.99 * 12 = $23.88 and $3.99 * 12 = $47.88. So this is where you really start to see why the Kids Edition will make sense for some families. Here's another area to consider. The basic Fire keeps its cost down by using Sponsored Screensavers. 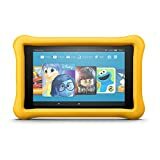 Amazon has extensive parental controls for the Fire in Amazon FreeTime which is available on all of the Fire tablets including the basic model. A FreeTime web browser for kids is also available which will appeal to many parents. Plus, there's an Amazon Activity Centre feature for the Fire tablets for kids who have outgrown FreeTime. Parents will be able see how kids are spending their tablet time. You don't need to choose the Kids Edition to get parental controls. The saving is bigger for non-Prime members as the Free-time subscription costs more. Let's take the same approach to comparing the 8" version of the Fire Kids Edition. Note that it's the 32GB version of the 8" Fire that's included in the Kids Edition. This time the bundle costs only $5 more than the comparable Fire tablet without special offers. If the extras make sense for your family, especially for younger children, then the Kids Edition makes a lot of sense and offers a big saving. For tweens and older kids go for the basic Fire, but consider paying the extra to get the advertising removed and adding on a warranty and an age-appropriate case. We think that the 8" Bundle is worth the extra for younger kids if your budget can stretch to it. The larger screen size makes a big difference in usability and you get 32GB of storage. Teens may value portability more than an increase in screen size. Nice comparison. Very helpful. Thanks a bunch!! !